India’s much-awaited GST Bill will be back on the agenda as the 2016 Monsoon session of parliament opens. If you’ve followed Indian Prime Minister Narendra Modi’s efforts to bring structural reform to the Indian economy, you’ve almost certainly heard of the Goods and Services Tax (GST) Bill. Originally introduced in December 2014, a new draft of the bill was released last month and the GST issue is back on the top of the Indian political agenda ahead of the opening of the Monsoon parliamentary session on Monday. The session will last for four weeks and Modi’s Bharatiya Janata Party hopes to push the GST bill through parliament, thereby winning praise from international investors for successfully executing on what is sure to be a transformative fiscal initiative. Of course, Indian politics being Indian politics, a GST triumph for Modi during the Monsoon session is easier said than done. The idea for the bill, which would impose a nation-wide value-added tax and simplify India’s labyrinthine and fractured taxation system, had started circulating under the previous Indian government, under the Indian National Congress-led United Progressive Alliance. 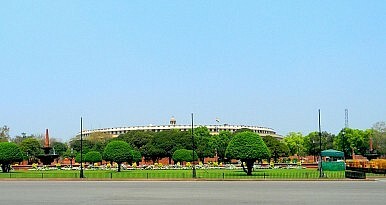 In 2014, the BJP, with a majority in the Lok Sabha (lower house of parliament), quickly introduced the first iteration of the bill. The BJP’s showing in state-level legislative assembly elections earlier this year, in May, somewhat improved its position in the upper house of parliament–the Rajya Sabha–but the party still needs the support of the opposition to make the GST legislation stick. The GST would require an amendment to the Indian constitution. The BJP has had no issues getting the support necessary in the lower house, where it has dominated since the 2014 general election, but opposition’s acquiescence in the Rajya Sabha, it appears, will only be forthcoming as a result of political wheeling-and-dealing. The government’s language on the GST bill has increasingly intensified around the emphasis of the proposal’s technocratic merits and necessity. “I do not think any political party will try to commit suicide by opposing [the GST bill],” Modi had told India’s Economic Times, essentially seeking to emphasize the point that the proposal’s implementation should be above politics. There remain some disagreements on the specifics of the GST proposal. For example, the Congress is reportedly looking to still modify the language used in the constitutional amendment to ensure that the GST tax rate will have a ceiling. The BJP government opposes the idea. Other issues of concern include provisions denying business tax refunds for increasing retail prices in reaction to a higher government tax rate. In any case, on Monday, the debate on GST will continue anew as parliament reconvenes. The Indian government is optimistic that this’ll be the moment for triumph, but investors eager to see the proposed reform become law have learned, when it comes to Indian parliamentary politics, to not count their chickens before they’ve hatched.